Jelsa is running out of rooms. Book now! Only 27km east of Hvar Town and on the northern coast of Hvar Island, Jelsa is an quiet appealing town surrounded by pine forests. The town sits at the foot of a pretty bay and there are hotels at either end of the bay. You won't be dazzled as by Hvar Town's incredible architecture but, then again, you won't be pressed in by crowds either--at least most of the year. After a brief burst of activity in the summer, Jelsa settles down to a long winter slumber. With an abundance of good private accommodation, Jelsa is noticeably cheaper than Hvar town as well. There was once a thriving fishing business here but now fishing boats are few and far between. The main activity is tourism, naturally enough, as there are several good beaches near town. The best are on the southern side of the bay near the Hotel Hvar. There's also a taxi boat to the naturist beaches of Zecevo and Glavice. There are a few two-star and three-star hotels in Jelsa on the outskirts of the town centre but they could use an overhaul. I recommend springing for the four-star Adriatiq Resort Fontana Delux or a private apartment. 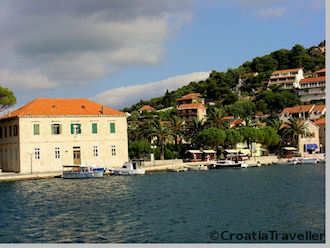 See my recommendations on private accommodation in Hvar Island. In the 14th century Jelsa served as a port for the nearby village of Pitve around which are several sources of fresh water bordered by poplar trees. A parish church was built, the Church of Sts Fabian and Sebastian, whose most notable feature is its 17th-century Baroque altar. In 1535 the townspeople erected a fort as protection against the Turkish attacks of 1571. Refugees from the mainland, fleeing the Turks, came to Jelsa and brought with them a wooden statue of the Madonna which now adorns the main altar. In the 16th century a square formed around the church although most of the buildings you see around the square now date from the 17th and 18th centuries. Jadrolinija's Split-Bol-Jelsa line operates daily all year but it leaves Split in the afternoon, making a day trip impossible. 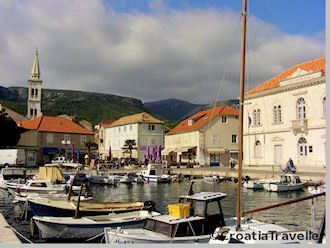 Otherwise, take a boat or ferry to Stari Grad or Hvar Town and then drive or take a bus to Jelsa See more on getting to Hvar Island and getting around Hvar Island. The tourist office is right on Riva in the centre of town.